The metal masses gathered outside Glasgow's iconic Garage venue for one of Europe's best extreme metal festivals, North of the Wall. Outside it was bright sunshine, inside as Abyssal (12/13) started up their demonic blast beat driven black metal, we are engulfed in darkness with the band all in hoods and bathed in ice blue lighting, and semi darkness. It's a suitably dark and impressionistic beginning to a feast of extreme metal. There are musical passages which have a majestic sweep and atmosphere, as the guitars, drums and vocals lock in and ascend from the stage. Their final number contains some dynamic tempo and melody shifts, particularly in the instrumental section, which demonstrate the tightly marshalled technical ability, that imbues the core of this great band's musical vision. They rightly garner a tumultuous crowd reaction at the completion of their set. A stunning beginning to the festival. Spectral Apparition (10/13) are the first band on the second stage, and combine an exciting spectrum of musical elements, where black metal collides with thrash metal, post rock and industrial. Their soaring compositions are full of interesting musical nuances, where intense thrash metal like sections crash into more meandering shimmering guitar passages. Hooded Menace (9/13) from Finland deploy doom influenced slabs of heavy guitar, with an overlay of strong belligerent vocals from Harri. There is also some seriously good guitar soloing, and there are clearly a lot of the band's fans in the audience, judging by all the heads moving. Fides Inversa (13/13) on the second stage, are striking in their corpse paint and hoods, and their full on barrage of black metal riffing never lets up during a festival defining set. The shock waves flying out from the stage feel almost powerful enough to knock you over! Interestingly the drum and cymbal fills have a jazz like quality in the way they leave space and accent the sound of the band. The screamed vocals are chilling and disturbing in equal measure, and perfectly compliment the sense of menace conveyed musically throughout this massively impressive performance. When The Ruins of Beverast (10/13) take the stage, the Garage is completely packed. 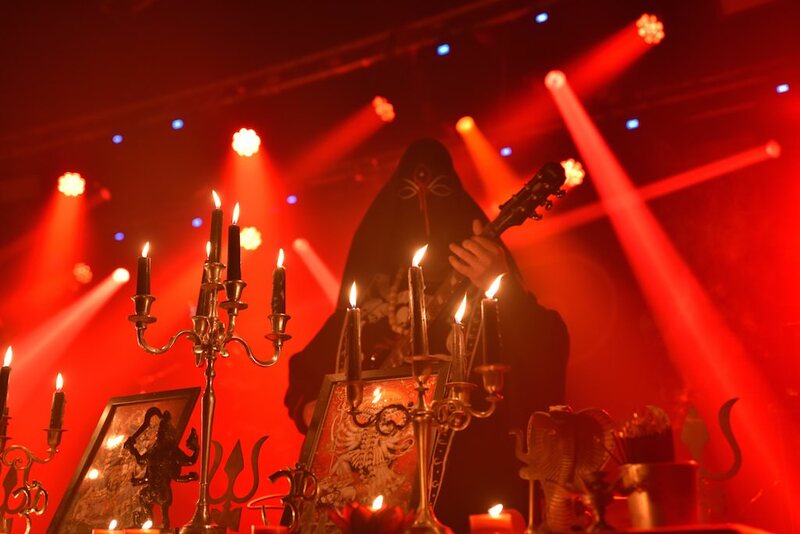 In Alexander von Meilenwald they have a very talented multi-instrumentalist and vocalist, whose death growl screams seem to come from somewhere very unworldly. Their music effortlessly blends the atmospheric soundscapes of black and doom metal with a death metal aggression. Darvaza (12/13), who share members with Fides Inversa, take blast beats to another level! The sound is utterly pulverising! The guitars create a hurricane of distorted sound, and when during one of their songs the band sing Lucifer in unison, the effect is very scary indeed. Their black metal is some of the most epic in impact, experienced by this reviewer. Cult of Fire (13/13) are pretty much like nothing you will have seen on a metal stage. With tables on each side of the stage bestowed with candles on ornate candle stick holders, accompanied by incense and icon paintings. The band are dressed head to feet in billowing cassocks and mounted hoods, Complemented by impenetrable and intriguing masks. The music combines atmospheric black metal with drone like tunings, and with the cymbals incredibly providing melodic counterpoints. It's a very innovative and intoxicating sound. In a touching moment the vocalist applauds the audience for really getting into the bands approach. The absolute highlight of Friday. 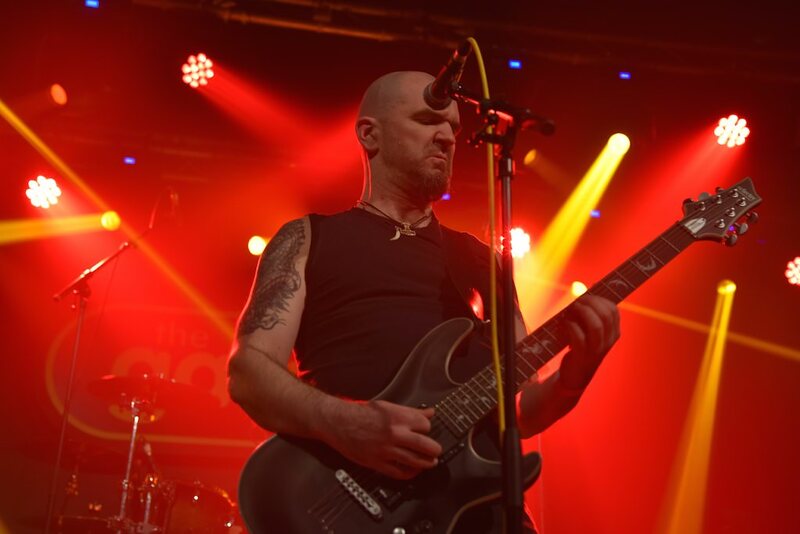 Dool (9/13) have a more mainstream rock ethos, which makes for a dynamic and high energy set, that is appreciatively received by the audience gathered around the Garage second stage. On the other end of the spectrum Bolzer (11/13) from Switzerland completed the first day of North of the Wall Festival with a scorching tour de force of death metal. The duo shook the foundations of the Garage pretty hard. The death metal grooves were given lengthy work outs, really allowing the band to explore the expansive sound death metal is capable of. The alternating growled and clean vocals also provided an intriguing contrast during their set. An intense and quite formidable musical introduction to day one of the North of the Wall Festival.